I gave that word some thought. Retro. I mean if you really want Retro Christmas, you should go right back to the first one and have a manger, right? But based on the inspiration photo, I thought I should do something a little more recent. Remember those aluminum Christmas trees? 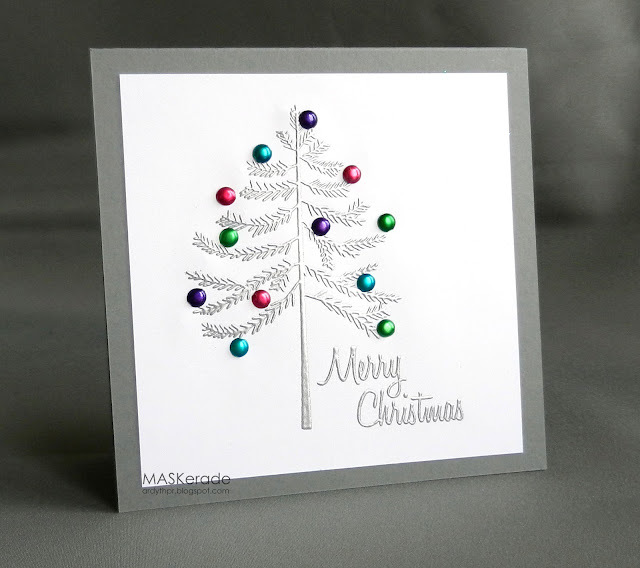 I used a Hero Arts tree and a retro-feeling sentiment, stamped in Versamark and embossed in silver. Then, taking a cue from my friend Susan at Simplicity, who reminded us this week that one way to get rid of some of our old supplies is to actually use them, I used some brads as ornaments to add some colour and texture. I'm glad I didn't follow up on my "promise/threat" to mail all my old embellishments to her, since she's using hers so well! Besides, as I said to her, based on the amount I've got, I don't think I could afford the shipping! So pretty, Ardyth! I love all the silver with the coloured baubles! I love this tree...it is gorgeous! And...I'd have the same problem if I tried to wrap up all my supplies I don't use! Ridiculous! This is a very retro look indeed. And, what a super way to use those brads. They look just like those cute embellishments that are sold now--you know the kind that are cheap, until you buy 25 packs so you can have all the colors. Retro is going back to an earlier time, and you captured the early 60's perfectly. My brother used to go looking for old aluminum trees to decorate their house. Such a fun look - and card. This just popped out in my google reader! I LOVE this and think it is my favorite card of yours ever!!! My Aunt had one of these trees that would sit on the...ready for this... the Hi-Fi every Christmas. (Hi-Fi may need to be googled by some!) I love the metallic glaze on these brads - they really do make gorgeous ornaments! Perfectly embossed and balanced. I absolutely love this card - seriously stunning! oh does this bring back some amazing memories! We had one of those trees but used only two different colors for the ornaments, hot pink and gold and a multi colored spinning flood light. So much fun to see your idea of a retro Christmas tree and you are spot on! Fabulous. This is so fun, Ardy! I read Kim's comment above - same with us. My foster mother was "modern" and got one of those trees with the colored light wheel. It was God-awful, but your tree is anything but! Also excellent way to use your brads!! Ahhhh, LOVE this!! So very retro. SO very modern. How can that be? Never knew an aluminum tree could look so gorgeous!!! 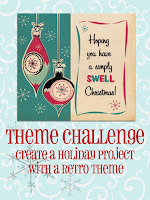 Great idea Ardyth...it IS retro, and it's gorgeous!!! Ardyth, this is AWESOME! 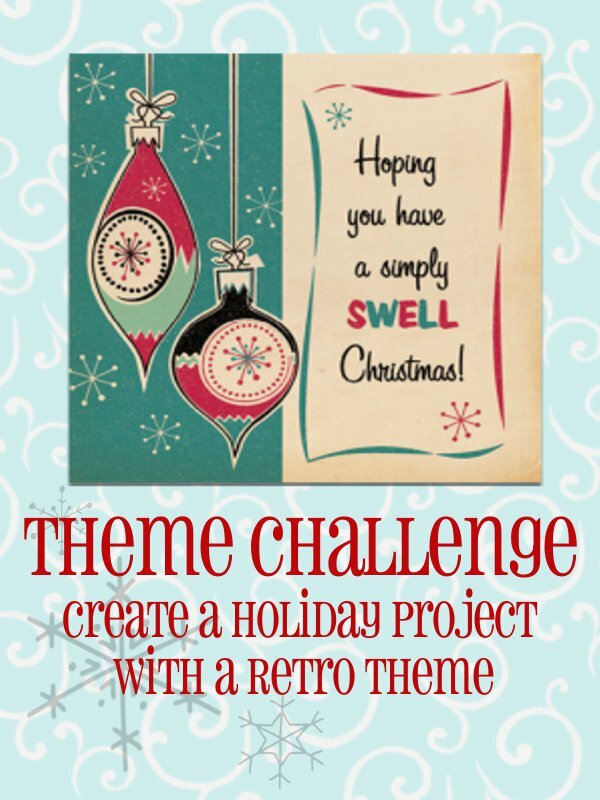 I love the idea of the tinsel tree, and the font of your sentiment is perfect for the theme, too. I love the idea that it's time to just use what I have - I am trying to refrain from buying much other than stamps (I can't turn down stamps!!) until the shelves around me start to feel more bare! !